- Designed with filler on palm which is better to protect your hand. - Elastic nylon loop on cuff allows easy donning and adjusting according to your wrist. - Durable synthetic fabric and superior construction stands up to a high degree of wear and tear. - Two sizes for your choice. Size L and XL: 4.1x9.3 inch; 4.5x9.4 inch. Designed with flexible plastic armor on the main part of hand which can protect your hands. Full finger protection. Flexible fabric offers the shooter maximum dexterity. Sides and back are made from nylon mesh whicn can provide maximum breathability and comfort. Soft and comfortable. Provide excellent grip and prevents your hands from slipping. 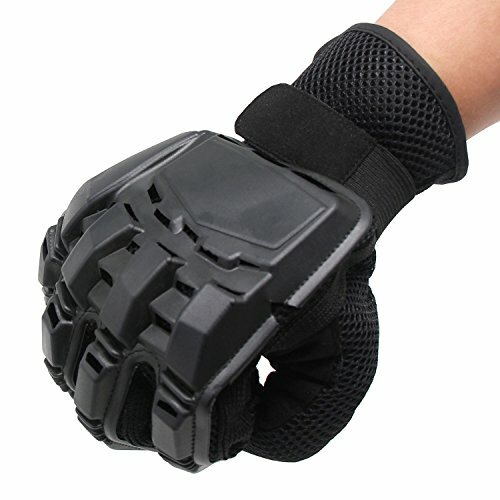 Ideal for tactical combat sports like paintball, airsoft and war game, etc. Great for mountain biking, hiking and riding, etc.